Ms. Sam is our teacher of the month for February. Ms. Sam is in our infant room working with the 6m-12m olds. 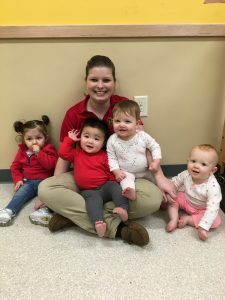 She has a natural gift of working with babies and their families. Ms. Sam always comes in with a smile on her face and ready to work and play. We are so happy she decided to start her childcare career with All About Kids in Lewis Center.